Nathalia Arja photographed by Nathan Sayers for Pointe. This is Pointe's April/May 2015 Cover Story. You can subscribe to the magazine here, or click here to purchase this issue. It's the day after Christmas and Miami City Ballet's dancers are taking class onstage in West Palm Beach, where, in a few hours, they will begin the last run of their Nutcracker season. Soloist Nathalia Arja throws herself into a final combination, leaping and turning with abandon in a display of strength and speed that defies the expectations set by her delicate and diminutive body. As she nears the end of the stage, she realizes she's done the wrong step. But instead of slinking off in embarrassment, she throws an arched arm up in a dramatic pose, lifts her chin and flashes a triumphant smile, as if it's what she'd intended to do all along. That athleticism, energy and confidence have marked Arja's dancing since she came to the U.S. from her native Brazil to study at the Miami City Ballet School at age 15. 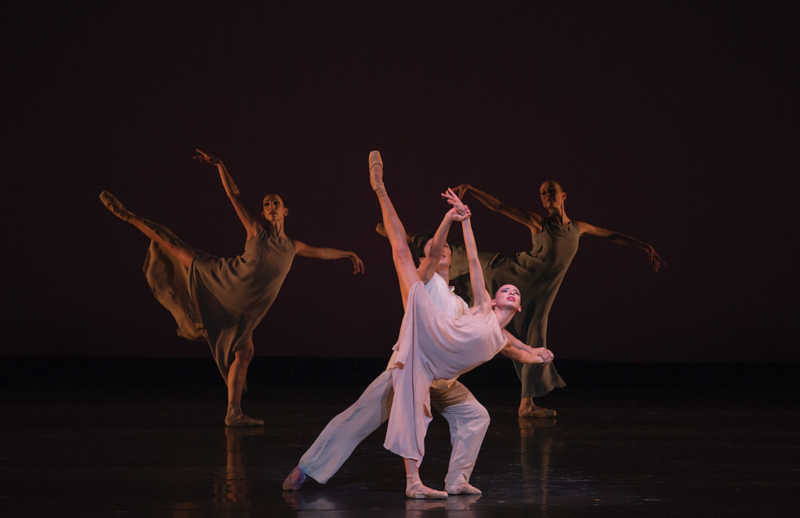 But it is the honing of those natural gifts under MCB's artistic director Lourdes Lopez that has fostered a more mature poise and polish, earning her the most prominent roles of her still-blossoming career. Arja with Renan Cardeiro in "Tschaikovsky Pas de Deux." 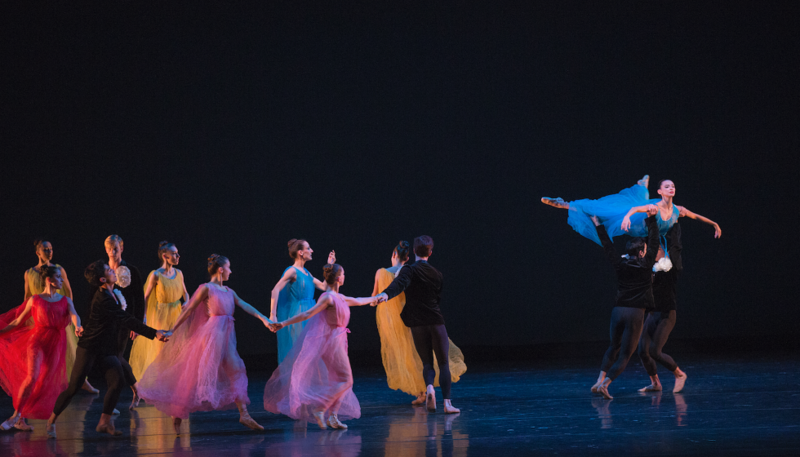 Photo by Daniel Azoulay, Courtesy Miami City Ballet. “She has always had a tremendous personality onstage, and this amazing jump and turn that wows people," says Lopez, of Arja's natural gift for bravura roles. “The question for me was, Can she do all that with the cleanliness and the line the art form requires—but without changing who she is? I think she's done that. She's had that breakthrough moment." Arja, 22, was promoted at the end of last season, after challenging but well-received lead performances in Ballo della Regina and Don Quixote. This year she has continued stretching her range, with principal roles in Paul Taylor's Mercuric Tidings, Balanchine's Symphony in Three Movements and Justin Peck's Heatscape. The 5' 2" Arja has been groomed for the challenge nearly all her life—she's the daughter of two dancers. Her mother, Alice Arja, owns one of the top studios in Rio de Janeiro and her father is director of Teatro Municipal do Rio de Janeiro, the country's main ballet company. 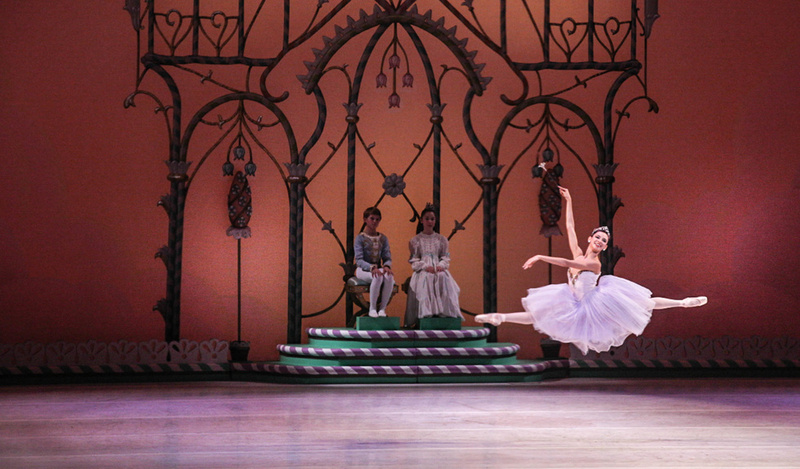 Arja in "George Balanchine's The Nutcracker." Photo by Daniel Azoulay, Courtesy Miami City Ballet. But it wasn't love at first sight. As a toddler, she told everyone she wanted to be an actress or a weather forecaster—definitely not a ballerina. It wasn't until Alice Arja assured her 5-year-old daughter that she wouldn't be forced into the art that Arja, whom Lopez calls “a strong-willed little filly who knows who she is," embraced the calling. “It was a huge release," she says. “Eventually I gave in. It's in the blood." Arja and Renan Cerdeiro, the son of a family friend, quickly became the featured students at the studio, dancing their first pas de deux at 6 and taking home honors on the local competition circuit. Alice Arja expected them to set an example, but when they were all of 8, the two marched into her office to complain: They didn't want the responsibility. They wanted to be “normal kids." Her mother explained she was just preparing them for their chosen careers, which would be filled with discipline and difficulty. Arja soon accepted this as the status quo. “I got used to the pressure. It was always there and people were ready with expectations wherever we went." Arja with MCB dancers in "Symphonic Dances" by Alexei Ratmansky. Photo by Daniel Azoulay, Courtesy Miami City Ballet. That preparation served her well when she and Cerdeiro were offered scholarships at MCB's school after submitting videos in 2007. With two other students, they moved into a cramped one-bedroom apartment in Miami. The transition was not easy. They spoke no English, didn't know how to cook, clean or open a bank account and were desperately homesick. “We had to figure out everything for ourselves and it was very hard at first," says Cerdeiro, now a principal with MCB, who was Arja's roommate for several years. “The fact that we came together made it easier for both of us. We're like brother and sister, then and now." Adds Arja: “He was the reason I never called to go home." Arja also faced an abrupt change in training. Raised on Vaganova technique, everything about the Balanchine style seemed arduous—the speed, the repetition, the arm/leg coordination. She also had a few bad habits, such as forcing turnout through her feet, says Geta Constantinescu, a principal faculty member who worked with Arja when she first arrived. “But those were quickly corrected," says Constantinescu. “And from the beginning, she had this incredible aura, this quality that is hardest to maintain—the freshness that every day is a new day." Arja and Cerdeiro, who are still frequently paired onstage, were celebrated for the fluidity and assurance of their partnership, born of both familiarity and discipline. But they also stood out for their mindset, says Arja's boyfriend, MCB corps member Ariel Rose. “What sets them apart is not just their physical training, but their mental training," observes Rose. “Dancers are often so focused on doing every step right. Those two have no fear. Nathalia has the ability to laugh at herself and to accept that making a mistake is part of being an artist. And not being afraid to make a mistake almost gives her the power not to make them." Seeing her ability and her toughness, then-director Edward Villella gave her performing opportunities with the company early on, even while she was still a student apprentice. In 2011, he promoted her, at 19, to the corps and began assigning her soloist roles. Arja with Shimon Ito in "Symphonic Dances" by Alexei Ratmansky. Photo by Daniel Azoulay, Courtesy Miami City Ballet. “He was the one who said to me, 'It's all about the preparation and how you finish,' " Arja says. “He encouraged me to really move big." Villella's abrupt departure in 2012 was traumatic; Arja, along with other MCB dancers, questioned her fate. But Lopez says Arja's innate talent stood out instantly—as did the need for some “finishing touches" to her pointework, leg lines and foot presentation. “She could do everything, but I realized there was a kind of refinement Nathalia needed," Lopez says. To challenge Arja to take her skills to the next level, Lopez cast her in roles that demanded both fierce technique and nuanced artistry, including the lead in Ballo, for which Arja was coached by originator Merrill Ashley. In moments of discouragement, Arja recalls silently thinking: “I don't know if I can do this!" She studiously applied Ashley's corrections and took ownership of the role. Though reviews—which Arja never reads—were mixed, she says simply, “It went the way I wanted it to." Still, when Lopez called her in after class one day to tell her she had been promoted to soloist, Arja was the only one surprised; everyone else had already assumed the move was imminent. “I started crying and the first thing I said was 'Are you sure?' " Arja recalls. “I couldn't believe it. All that hard work, to have someone recognize that. It was the happiest day of my life." The dream she once voiced to Villella—“to become a principal with Miami City Ballet"—is still her ultimate goal. But Arja now dreams of branching into roles that test her ability to be soft and expressive, rather than just a powerhouse. “I'd love to do something more lyrical, something slow," she says. “I want to look different every time I'm onstage. I want to try always to move forward." Now, a challenge once intimidating has become enticing; a country once foreign is now more familiar than her own. For a few more years, she must make an annual trip to Brazil to renew her visa until she becomes eligible for a green card, but she doesn't envision ever leaving the U.S.
“I love America," says Arja. “This is my home now and Miami City Ballet is my family."